Country-rock girl with guitar sings up-tempo hooky tunes (fans report singing in the shower and at the wheel) and memorable ballads with lyrics steeped in love, loss, and life’s hard lessons. 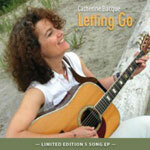 Catherine Bacque’s limited edition EP, Letting Go (2009), was the debut release for the Scarborough singer/songwriter. Now working on her second CD, Catherine is “breaking down the closet door,” according to a U.S. songwriter friend. In the past, Catherine has taken the stage to front a jazz/rock/funk fusion collective, a Top-40 cover band, and a country five-piece, among others. Catherine’s own playlists run the gamut from Nora Jones, Dala, Dan Mangan and Dallas Green to Crowded House, Tragically Hip, Beth Nielsen Chapman and Kathleen Edwards. Her own songs draw from personal experience which is universal: love, loss, life’s hard lessons. Idealism and skepticism play tug of war in “I Did, I Will, I Do” and “Say That You Want Me”, upbeat love songs of ‘goodbye’ and ‘hello’ respectively. “You’re Still Mine” is an anthem of unconditional love, and “With You” and “Fly” struggle with the need to be yourself and chase your dreams. For the new album, Catherine has been writing “just outside my comfort zone,” she laughs, inspired by a short film script, the lives of teenaged girls, and “our rapacious consumer society.” “Message to You”, a bonus track included in the new mix of Letting Go, featuring Johnny Johnson on soprano sax, is a co-write with producer Alan Hardiman, written for a film by James Cooper currently in pre-production.